Just in case you haven’t noticed this, there’s a new big MMO Kickstarter presently running with a full head of steam. It seems good, and some of the pedigree is great (Raph Koster, J. Todd Coleman are ones that caught my eye). It picks up on ideas I’ve written about before, and would still love to see in a big MMO. It looks great, more like Wildstar, WoW or perhaps Torchlight rather than FFXIV or Guild Wars (I like dodging the Uncanny Valley, but I do love GW2’s more painterly art direction). It could be a great game. I want to be excited about it, but I’m feeling sort of amputated from the game world. I worked there for almost ten years, and still love game design, but since I have almost no time to play and I’m sort of retired from the industry due to circumstance, it’s all just sort of… attenuated. Still, Crowfall could be really good. Go check it out. I’m just putting it out there at the moment without explanation, though. I’d like to see if it’s readable and interesting. My designs lean more to the “tribal” aesthetic than the Olde Tyme Fontography. It gives me a bit more flexibility, though it’s not always as readable. It’s interesting to me to see how these might work. They often try to “hack” our natural tendency to see patterns, especially with the little bits and floating details that might be important one way but best ignored the other way. Sometimes it’s easier with more words, too… and sometimes not. They can give more datapoints to help decipher the rest of the puzzle. This one is for the Alhambra Speech and Debate team, for example, and some of it works well… other bits don’t. A lot depends on context; someone on the team would be able to read it fairly easily since they would expect it to be relevant to their interests. If you’ve a guess at what this latest one reads, I’d love to see it in the comments. Thanks! 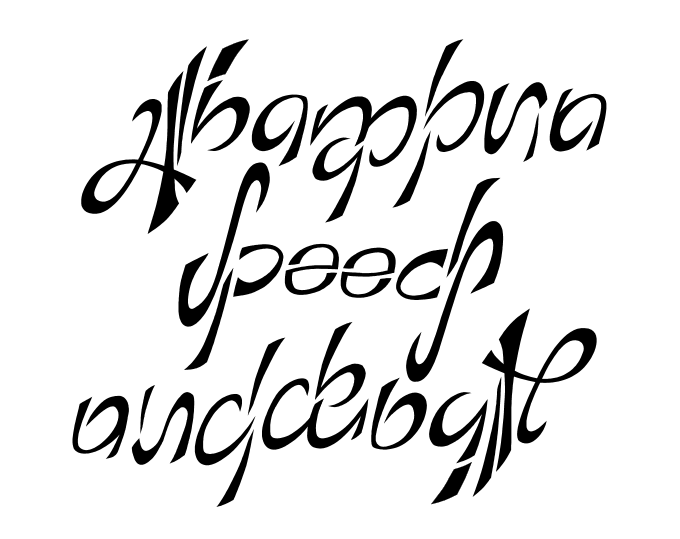 Updated with this application of the ambigram… and the word: “Chiaroscuro”. Thanks, all!